I've had these in my game for a while, but never let it be said that I'm against hopping on bandwagons. Especially where new Maxis stuff is concerned. May a BFBVFS strike my game if I'm wrong, but I have never seen these grave markers come up anywhere before. 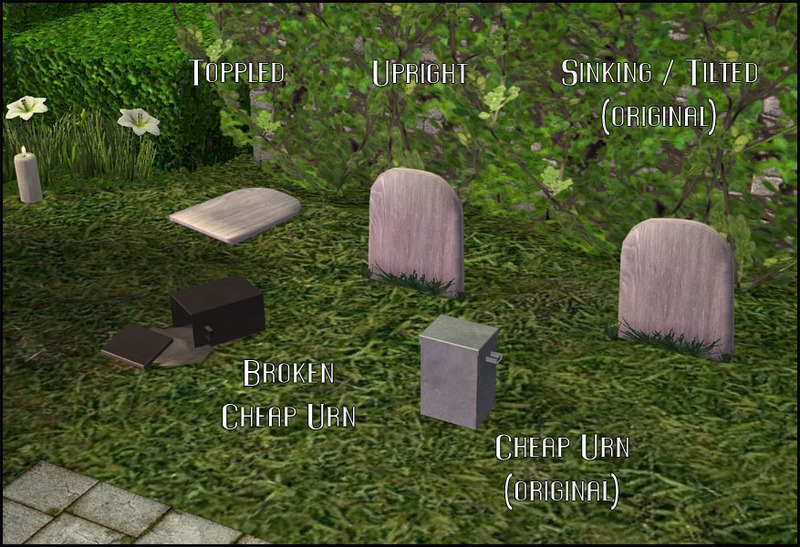 In the deep recesses of the Objects03 file (okay, so more like right there in alphabetical order,) there lurked cheap versions of both a headstone and an urn. The headstone had a mesh with no texture, the broken urn had a texture and no mesh, and the whole urn had both. The headstone was given a weathered wooden texture, much like those used in the Old West, 'cause, come on, what could be cheaper? The mesh in the Maxis files is starting to slightly sink into the ground on one corner, but that would look silly if every headstone in a line was doing it, so I also made an upright mesh. And a topppled mesh, just because I could. The cheap urn was only altered to add inside faces to the lid; it turned invisible from the inside, otherwise. If you looked at it from any low enough angle, it was pretty obvious and looked unfinished. Which I suppose it was. The broken urn was made from the whole urn's mesh plus the ashes from the broken normal urn. The urn body had to have faces added to avoid inner invisibility, too, so it has about double the polys of the whole urn, but it's still a low amount, as deco goes. All five meshes are basegame compatible, and have adjusted shadows. The urns can be placed on any surface that will accept the Ming vase. They're all in Decorative > Sculptures and range between $10 - $45.